I have a portion of my portfolio set aside specifically for cheap bank stocks. In the terms of some value investors my dedicated cheap bank portfolio might be considered a 'basket'. That is I buy tiny stakes in many banks if they meet certain criteria. I purchase larger positions in banks outside of this basket, but inside of it most positions are roughly the same size, about a quarter of a percent. No single bank is going to make or break the portfolio, but as a group I have a large exposure to undervalued banks. Sunnyside Bancorp (SNNY) is one of these banks. Sunnyside Federal is a savings and loan that was established in 1930. The bank is located in Westchester County about 25 miles north of New York City. The bank's headquarters and only branch is located on Main Street of the quaint Irvington a few blocks from the Hudson River. They're also located near a number of country clubs, which should tell you something about the area they're located in. Westchester is the second wealthiest county in the State of New York with median home values of $533k and median household income of $81k. The bank started as a mutual meaning the depositors owned the bank. The bank felt constrained by their mutual structure and in 2013 conducted an IPO. The IPO raised $7.9m with the sale of 793,500 shares at $10 per share. Depositors are given the first opportunity to purchase shares and with the completion of the IPO the shares now trade on the secondary market. The IPO proceeds plus their capital prior to the IPO gives them an equity value of ~$12m or $15.12 a share. Given that shares most recently traded at $9.45 this is an attractive stock at 63% of book value. The bank's conversion from a mutual to a stock company was in an effort to pursue growth. The bank is as safe as they come with a 35% Tier 1 capital ratio and 13.7% Core capital ratio. They have a very small amount of non-performing assets, and OREO. Some small banks trade for less than book value because they have an asset quality problem, Sunnyside does not. Sunnyside has a growth problem. As I said earlier the bank has a single branch. The common wisdom is that one branch banks are at a significant disadvantage because they can't spread costs between branches. In some cases this is true, but it's not a universal truth. Consider the Bank of Utica (BKUT) that has a single branch and close to $1b in assets and $770m in deposits. There are other one branch banks that have been able to grow to a large size as well. The issue of scale in banking isn't related to the number of branches, rather it's related to asset size. A paper by the FDIC found that most economies of scale were reached when a bank hit $100m in assets, and became insignificant after $500m in assets. The size of assets is critical for Sunnyside. With their current $40m in loans and $90m in assets they aren't making enough to keep the lights on. The bank has been reporting small quarterly losses for a while now. The bank's management plans to put their excess capital to work by expanding their mortgage origination and SBA lending. Both mortgage origination and SBA lending are similar in that they're both relying on government guarantees and backing. With SBA lending a bank makes a loan to a business borrower where the government guarantees a portion of the loan reducing the risk for the bank. Mortgage origination is similar, a bank makes a loan to a borrower and then either sells the loan to a larger bank, or back to the government and keeps the servicing rights. The bank makes money servicing the loan plus earns an origination fee without tying up their balance sheet. This is a good strategy for a bank whose balance sheet doesn't have a lot of firepower, like Sunnyside. 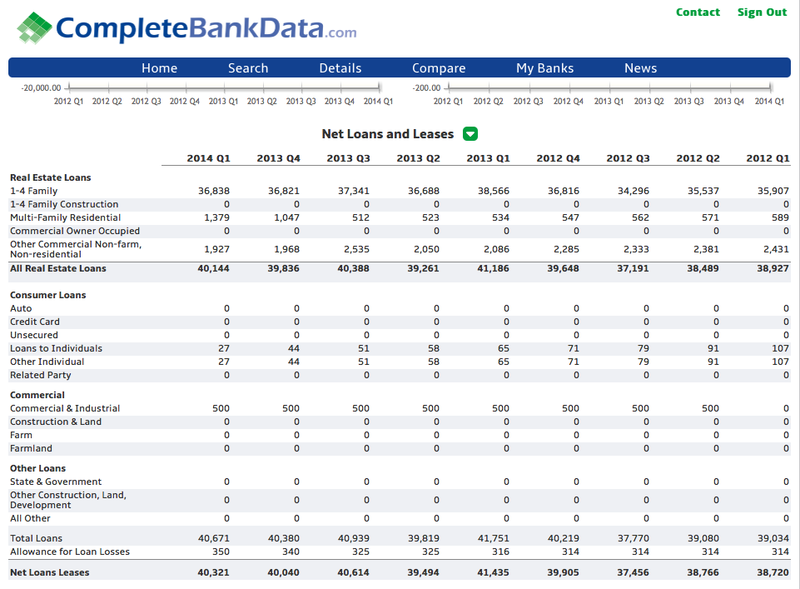 The bank currently does almost no commercial or business lending other than residential business lending. This gives rise to the question of whether the bank has enough experience with business borrowers to tap into loan demand. If the bank can't generate SBA loans like they want they will need to find other routes for growth. Fortunately the bank doesn't need to do much to become profitable. Their net interest margin, the measure of interest taken in minus interest paid out is below the industry average. Raising their NIM from the current 2.8% to the industry average of 3.37% would bring in an additional $521k in net interest income, and after taxes would be more than enough to propel the bank to sustained profitability. I like investing in companies where small improvements in the company's operations can result in large financial improvements. It might seem outlandish for a tiny bank to raise their NIM by half a percent, but given all the bank's excess capital I don't think it's unreasonable. If the bank is able to achieve profitability again there are a number of other catalysts for shareholder value. As a newly demutualized bank they are prohibited from buying back shares or paying a dividend until certain anniversaries are met. The company can buy back shares on the first anniversary from their IPO, pay a dividend on the second, and sell themselves after the third. One branch banks are great tuck-in acquisitions. The top management at Sunnyside makes a combined $514k in compensation, which given the area they're located in is reasonable. Yet if the bank were to sell and top management redundancies eliminated the acquiring bank would realize those savings in their earnings. This money losing bank is suddenly profitable without the top level salaries. If an acquirer were able to both remove management and raise the NIM to industry averages it could result in an additional $700k in earnings, or about $1 per share. So while investors see a tiny bank that's losing money a potential acquirer sees $1 per share in earnings or more depending on other cost savings. As I was writing this post I read an article about the new football coach where I went to high school. He discussed his plan to turn the team around. He said the team had problems executing consistently and doing the small things right. If they could consistently get the small things right he believes they'll see success. That statement is appropriate for Sunnyside as well. It might seem crazy to invest in a money losing bank. At 63% of book value if management can consistently execute on the small things, and loan out some of their excess cash I have no doubt shareholders will be rewarded. 1. Is this pick an exception to your two-pillar strategy when it comes to discount-to-BV stocks, since this is missing the earnings support? 2. If so, are you making the exception because it is a small bank stock and therefore maybe a special case of BV investing? 3. Are you confident enough SNNY can achieve these "small improvements" in NIM such that you would not call it a speculation? I think you might have a misunderstanding of my investment process. I don't need a company to be a two pillar company to make an investment. I do prefer those, and have found those types of companies to do well, but most are not. There are no earnings to speak of, but if you look at my conclusion I show that the bank has a pro-forma takeout value that's close to book. So yes, you could say that book value is supported by adjusted earnings to a control shareholder. Even if they don't make any improvements they have value, there is a value to their deposits and their loan book. They could sell the loans for par most likely. On almost any metric you can find they're undervalued, relative, DDM, take-out etc. Thanks for the thoughtful clarification. I do realize you've made clear in past posts that you are not a mechanical quantitative value investor. I simply enjoy and profit from hearing insightful investors think out loud, especially when net-net and BV asset investors make picks that are not purely backward-looking-mean-reverting. I know others, like Third Avenue, have invested in discount-to-BV stocks like dying retailers with multi-year declining BV and earnings, but I had no access to the finer points of their thinking. SNNY is obviously in a different class, and you've made their case persuasively. It's clear with the de-mutualization that they are highly motivated to grow, and that the odds stack up in favor of growth. SNNY is light-years apart from those "net-net" biotech companies that continually lose money in the hope of a future payoff. Therefore, forward-looking earnings anticipation is not a stretch in this case. So it's not so much a speculation (in it's pejorative sense) as an intelligent investment. Demutuals are fascinating. I consider them the net-nets of the finance world, but at the same time they have characteristics of spin-offs. There are a lot that barely earned a dime while mutually owned and suddenly are cranking out profits when public. I know this area very well: the bank is named after Washington Irving's home. Do you know the ownership of the bank? I don't know much. In the proxy it says the ESOP owns 7% and directors and executives own 3.5%. There are no other large holders beyond that. Nice article Nate. I always enjoy reading your write-ups. This one is especially cool because I live literally across the street from Sunnyside Federal. That's crazy! I looked the bank up on Google Streetview when I was writing this. It looks like a nice little town, some cool shops and right by the river. Do you have an account there? Is the bank in decent shape? It's an ok little bank. I've been in for only a second. A little old and dusty. If you have some specifics that could be gleaned from on-site, let me know. I can do some DD. Yes, great town to live in. Right on the Hudson. Since each bank in the basket would be 1/4 of a percentage point. With a portfolio of $1mm, you would only have an exposure of $2,500/bank. So either you have a huge portfolio or your trading costs must be extremely low to allow such a basket. Can you please explain? Well I'm not a millionaire... you can trade cheaply in the US. With Interactive Brokers you can trade for $1. Do you use Interactive Brokers? This is definitely one of your best finds, and warrants some serious due-diligence. While I know this location — I think it's fair to argue that it's one of the best around (which could have interesting real estate implications) — it isn't within driving distance of me right now. Otherwise, I would do some sleuthing right away. There was another microcap nearby, which I found somewhat compelling: GTAX. They advertise on the MetroNorth commuter trains, and I was surprised to see that they were public. It was recently acquired, and check out the return from '11 onward. Nate, it looks like you have the power to move the market! Are you concerned with the declining deposit base? An edifying post as usual. Keep 'em coming. Sandler O'Neill Asset Management bought a 4.41% stake (35,000 shares) in the 2Q, making it the second-largest holder after the ESOP, per Bloomberg data. As a customer of this bank and many other banks- I find NOTHING going for this bank that deserve mention EXC EPT your figures that a buyout from another bank can make sense. WHile you glossed over the fact that this bank had to go from MUTUIAL to Stock mainly because it was losing money the fact that stockholders now have to make that up instead of its customers is no solace. Holding this banks stock for some kind of buyout may be not a reason to buy the shares as long as the bank itself has at its core a very limited banking services and simply poor business practice. This bank has very limited services, has restrictions on loan amounts to each customer of like a million dollars or slightly higher. In a neighborhood where houses are 2 and 3 million I fail to see how they can attract business with such limits and furthermore if you had a mortgage with them then your limits may prevent your business from borrowings with this bank so really you move into a this neighborhood and have a business too that they may have limits against you- so why bother starting with this one branch bank. The Loan department has high turnover so you cannot build a relationship- a strong reason for choosing a small bank. The commercial rates and fees are non-competitive. They do not have the ability or resources or wishes to be personal with their customers from a banking relationship. They don't call you if your overdrawn, they probably wont call you if you were late on a payment- so really this small bank has a lot to work on. Management is well entrenched with generous salaries for its board- and I see the board has invested in the bank with enough shares to keep their place and salaries- so realistically a small town bank with small town ideals and limited growth makes for a bad investment.